The garden in winter doesn’t normally get a lot of attention. 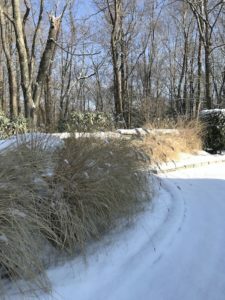 However, with a little time and energy during the growing season you can add some ornamental grasses that will give life to your wintertime garden as well. We know ornamental grasses accent a garden at any time of year, but they just might be at their best in the dead of the winter. They provide texture and movement in the winter landscape – elements often lacking when the rest of the garden has gone to sleep. When the rest of your landscape is taking a visual rest, the colors, textures and movement of the grasses has a beauty all its own. Many varieties do double duty by attracting birds to your winter garden providing shelter and food. Maintenance is simple – cut back in the spring before new growth appears. Honestly, we think they’re worth growing for their winter interest alone! Two of our favorites that are super hardy zone 4 grasses are panicum Northwind and calamagrostis Karl Foerster. Try them in your garden this year! With all the ”buzz” about bees and butterflies, BUTTERFLY WEED is an excellent plant choice for the 2017 Perennial of the Year. Known for its ability to support insects and birds and serve as the primary caterpillar food for the beloved North American native Monarch butterfly, it puts out 3 months of tangerine/orange blooms on perfect little upright shrubs 24” tall and wide. Hummingbirds, bees, beneficial insects, and other butterflies also love the flowers, which are laden with pollen and nectar. They grow best in full sun, are deer resistant, and tolerant of wet or dry soils. They are hardy to zones 3-9, and native throughout almost all of the Eastern states. 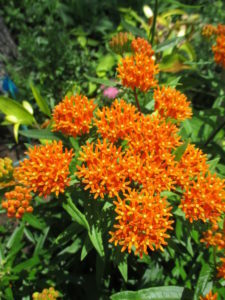 Since Asclepias tuberosa is a native prairie plant, butterfly weed is quite comfortable in meadow gardens, native plantings and wildlife sanctuaries but is finding its way into more formal to semi-formal urban gardens. Plant it in large masses, for an unrivaled display of eye-popping orange. Butterfly weed pairs well with summer blooming Phlox, Hemerocallis, Liatris, Echinacea, Salvia, and most of June/July sun-loving perennials. The Perennial Plant of the Year showcases a perennial that is a standout among its competitors. Perennials chosen are suitable for a wide range of growing climates, require low maintenance, have multiple-season interest, and are relatively pest/disease-free. If you are looking for an excellent perennial for your next landscape project or something reliable for your gardens, make sure to check out the Perennial Plant of the Year™ archive list. At Miracle Farms we often chose plants on the list of past Perennial of the Year winners to be reliable bloomers year after year. 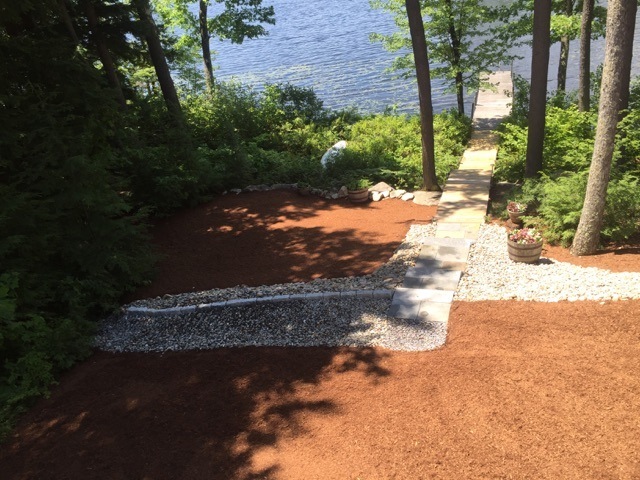 In order to maintain a healthy lawn, your soil requires water, air, and nutrients. Lawns become compacted with normal use including foot traffic and lawn mowing. All lawns need aerating at some point, but depending on the conditions and use of your lawn, your soil may require aerating more or less often than typical. Lawn aeration is the process of mechanically removing 2”-4” soil plugs and small portions of thatch from the lawn. Lawn aeration relieves soil compaction and improves the ability of roots to grow deeper into the soil and expand. Aeration is generally recognized as the best way to improve air and gas exchange, along with water and fertilizer intake. Lawns that receive this care will be healthier, easier to maintain and have fewer pest problems than lawns that are neglected. It is preferable to aerate your lawn in the fall when new root development is more prevalent. You should be able to see the ‘thatch’ layer, as it should be about 1/2″ thick or so just underneath the grass and above the dirt. “Thatch” refers to the non-decomposed layer of organic material between the soil surface and the living grasses. When thatch build up becomes too thick, the turf’s roots cannot receive proper airflow, nutrients or water. This leads to thin, patchy, and yellowing grass. This is when aeration becomes necessary. 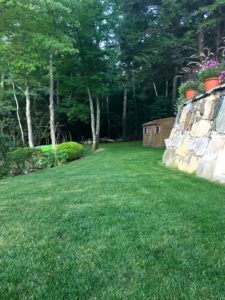 Some homeowners have trouble determining if unhealthy grass is due to soil compaction, thatch buildup, or another issue, such as poor fertilization. Let Miracle Farms help you to determine the best plan to get your lawn in tip-top condition. Don’t have time to aerate your lawn, or have a large property that needs aeration? Our lawn care experts would be happy to provide the help you need! Japanese Beetles on Vacation in the Lakes Region, NH? So one day your roses were covered in colorful blooms and then the next day… gone! 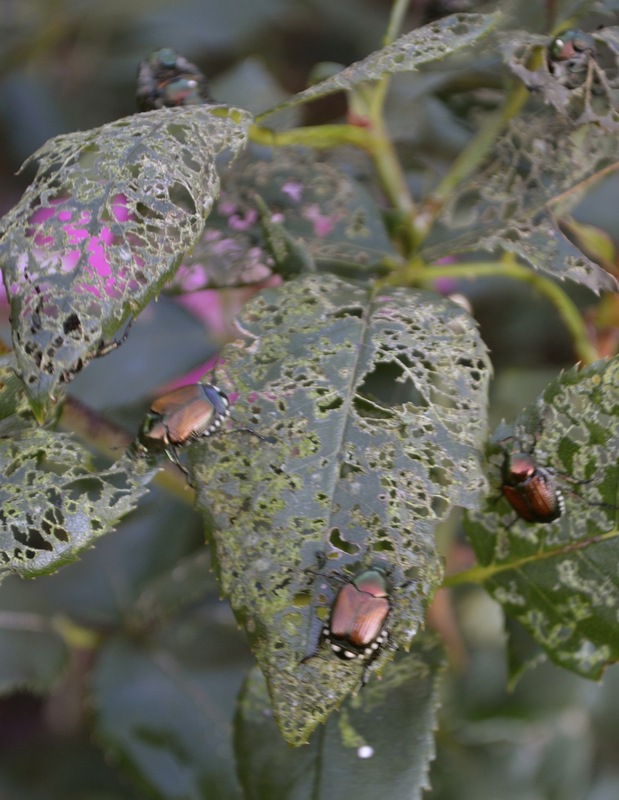 Chances are the culprit is the dreaded Japanese beetle. It’s late in the season for beetle damage here in the Lakes Region, but my knock out roses are still being devoured. The telltale sign, along with an extreme lack of blooms, are skeletonized leaves and even complete defoliation. Usually, the demons can be caught in the act. 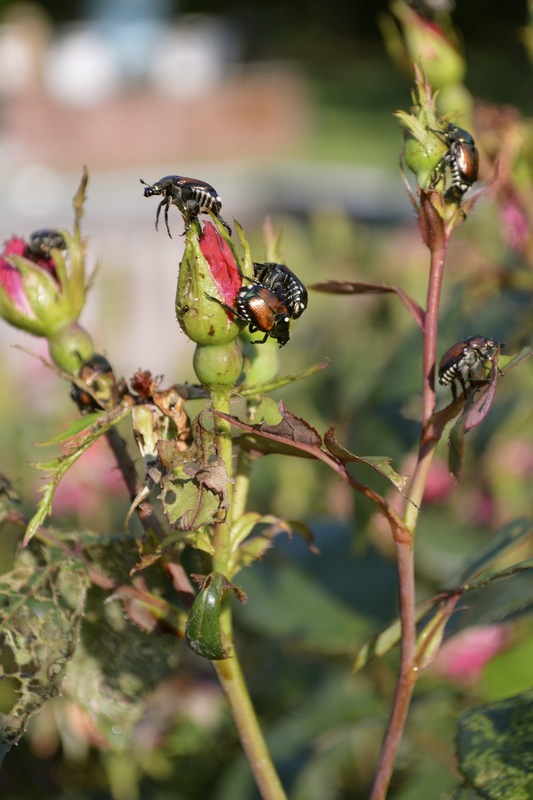 Japanese beetles also love to eat rosebuds – every last one that you’ve been anxiously awaiting. If you are unfamiliar with Japanese beetles, they have shiny, metallic green and copper colored bodies – kind of pretty in the worst sort of way. They are roughly 3/8-inch long and 1/4-inch wide. WHAT DO I DO ABOUT THEM? The best defense is a good offense. Japanese beetles are the adult stage of grubs that are found in your lawn earlier in the season. A good lawn program to control grubs applied early in the spring before the beetles emerge is your best bet. 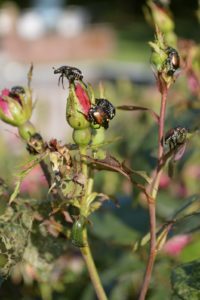 Watering, fertilizing and general good horticultural practices will also help reduce the damage caused by Japanese beetles. Inevitably though, the beetles still come and there are a couple of options to hold the major damage at bay. Spray affected plants with a pyrethrin-based insecticide the minute you notice them. This is a safe and effective control that can be used on flowers and vegetables alike. It will help to control other pests as well. To make every effort to cause no harm to honeybees with these products, do not apply during hours when bees are actively visiting the flowers. Neem oil is an “antifeedant”, which when used early on can be an effective tool to reduce feeding. Chances are you will have to reapply either of these options if the beetles last as late in the season as they are this year. Another helpful, but disgusting option, is to hand pick them first thing in the morning when temperatures are cooler and they move a bit slower and drop them in a bucket of water containing one tablespoon of liquid dishwashing detergent. If you are diligent about this it is a very effective way to clear your garden of these pests. Japanese beetle traps are helpful if you have the ability to place them far from your garden. They actually have an aromatic chemical attractant that brings them to the trap so you don’t want to hang it near the plants you are trying to preserve. Whatever option you choose – choose something fast! Timeliness and thoroughness of application are very important in controlling the damage or at the very least, keeping it to a bare minimum. New Lakefront Landscape Gets a Thumbs Up! 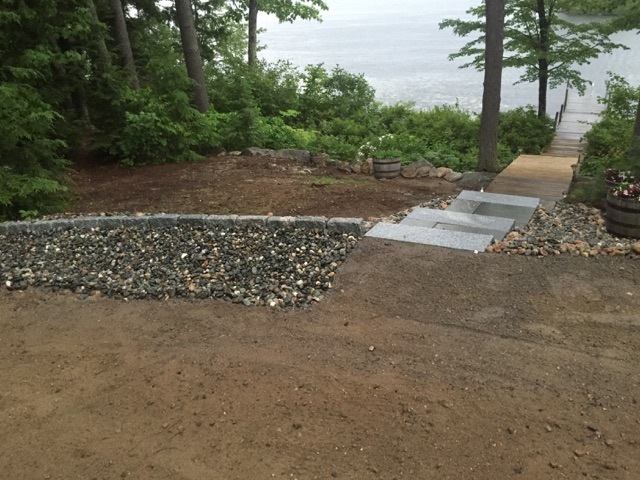 We want to tell you again how much we like the recent landscaping you did on our waterfront property. 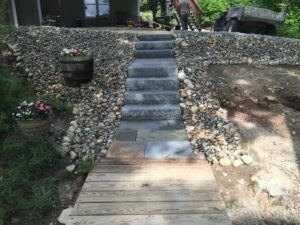 Your crew changed a mediocre back yard to one of exquisite beauty as well as being functional. It’s absolutely beautiful and beyond our expectations. Your men (Marcelino and Louis) did a fantastic job . We were impressed with their professionalism and their work ethic. Please extend to them our sincere thanks. If you and your company ever need a reference please feel free to ask us. We would highly recommend you . Again thank you for making our home just that much more beautiful. P.S. Horst also agrees, your guys did a fantastic job!